Scenario: You are in Brazil. It’s Day 2 and you decide to go to that night. You practiced a little Portuguese so far but you are still nervous about speaking in the language. Before you flirt in Portuguese, you have to prepare yourself mentally. I’m serious. It can be difficult talking to regular people in another language – think about the nerves you will have when you first approach a Brazilian woman you want to know on a deeper level. First, you talk to regular people the entire day. You go into stores and speak to people. You ask for directions when you are walking around. You ask retail employees random questions just to get them talking. You might even do a little flirting when you see an opportunity. You want to get as comfortable as possible with people talking to you in Portuguese. Before you can flirt in Portuguese, you have to be comfortable with speaking and hearing it. Talk to Brazilian women without flirting with them. Second, you observe Brazilian culture. And I don’t mean just the tourist areas. Walk around regular neighborhoods and feel the vibe of the environment. Pay attention to couples and guys trying to talk to women. See what works and doesn’t work. The Brazilian club is a little different from approaching women during the day but it’s still a good way to see the male/female dynamic. Third – have fun. The day should be filled things that make you feel good. Do things that put you in good spirits. If you are going to the club solo, you definitely want to do this during the day because you need motivation and high energy levels to get you going. Fourth, you visualize how the night will turn out. This might seem silly to a grown man but visualizing what you plan to do before you do it – is very powerful. Rehearse a few lines you learned from Flirt In Portuguese. And the last thing you should do during the day – pick the right venue. If you want to meet Brazilian women and flirt in Portuguese, you have to go to the right venue where you will have fun even if you DON’T meet anyone. If you like Afro-Brazilian women then you need to go to a venue where they will be in abundance. For example, in Sao Paulo, you won’t go to a Rock n Roll club on Rua Augusta. There will be a few Afro-Brazilian chicks around but they won’t be abundant like the clubs in Vila Madalena or Republica. If you like samba, you need to head to a samba venue. Your #1 goal for the night really isn’t to flirt in Portuguese – it’s to have fun. When you have fun, you feel good and you naturally flirt with women. You don’t have to be fluent in Portuguese to flirt in Portuguese. You just need the right vocabulary and a basic understanding of Brazilian Portuguese grammar and sentence structure. I lay out a 5-step process to flirting in Portuguese in Flirt In Portuguese: Phrasebook For Men. Here are a few other tips below. If you want to flirt in Portuguese with Brazilian women, you don’t need to learn how to say “dog” (cachorro) or “boat” (barco). You want to learn words like “drink” (bebida) or “smile” (sorriso) – words you will probably use on a date or in the club. Você é solteira? – Are you single? Think about what you say in English to women. Then try to find the equivalent in Portuguese. You need to keep your natural personality when you flirt in Portuguese. You need to keep your own style and think about what you would say in English. Brazilian women like authenticity. Show the real you through their language. Brazilian women like men who take the lead. When it comes to setting up dates – you schedule the time, you choose the place and you push the conversation along. Even if you aren’t fluent in Portuguese. According to a few scientists, communication is 85% non-verbal. So even if you don’t speak Portuguese, you can get your point across in other ways. A Brazilian woman will let you know what’s on her mind with her facial expressions and her body language. 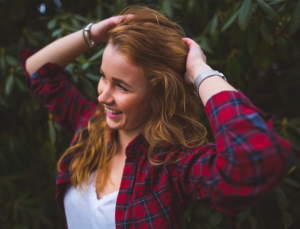 Learn how to flirt with body language if your Portuguese skills are extremely weak. Would you be interested in discovering everything about Brazilian women before visiting Brazil? Well – that’s exactly what men who find this blog do every month. Find out how they do it below and see how easy you can do it too. You are having trouble learning Portuguese. You know the most common verbs. You practice at least 10 minutes a day. You know enough vocabulary words to talk (even if you don’t realize it yet). You listen to your Pimsleur audio tapes every morning while going to work. You even know the conversations by heart now. But – you still don’t understand what the hell Brazilians are saying. And you have trouble making up sentences off the top of your head. Instead, you try to remember what Rosetta Stone told you to say. And it’s a common reason many people quit learning Portuguese. You need to learn Portuguese by watching videos. So you won’t learn a new language like a baby, no matter what language learning companies advertise. That’s not how adult brains work. Adults need to ACTIVELY learn a language. The big problem with audio-only is: you can’t see body language. If you’ve spoken with another human being before, you understand the importance of body language. A person’s arms, legs, head and MOUTH tell you a lot about what they are saying to you. Even if you don’t understand exactly what the person is saying, you can see if they are angry, sad or excited about what they are talking about. And it helps you understand the conversation eventually. So, watching Portuguese videos is mandatory. 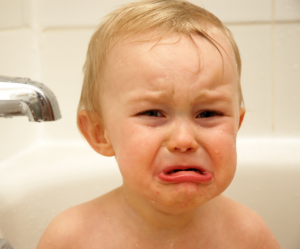 Stop having trouble learning Portuguese and use a video resource today. Time is ticking. Are you learning Portuguese the fastest and most entertaining way? 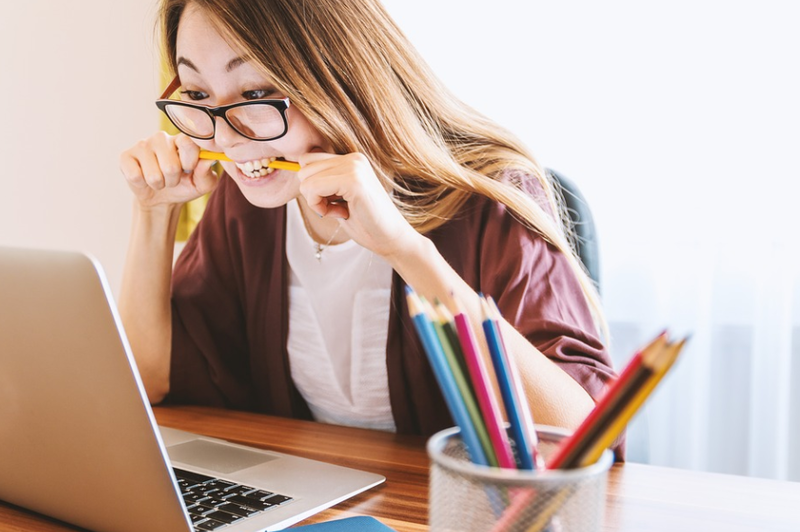 *Movies and TV shows have their place too but when it comes to active learning – using an educational video course is superior to a movie or novela targeting native speakers. The #1 resource for learning Brazilian Portuguese online. Oh. And it teaches you Brazilian Portuguese the way Brazilians speak it today! I recommend Semantica Portuguese for serious Portuguese learners. You don’t need to know a lot of Portuguese to start because the online course has video series for every level – beginner, intermediate and advanced. The only con for a few people is that it costs $20 a month. Cheaper than Pimsleur or Rosetta Stone but $20 too much for people looking for free resources. But like it says in the video below: Semantica really breaks it down for you. This is an interview style video channel. An interviewer walks around Brazil and asks people about a topic. It’s a great resource and it’s free! However, it is not for true beginners of Portuguese and its primary purpose is to improve listening comprehension only. I recommend this as a sidekick to Semantica Portuguese or the last resource below. And finally Brazil Pod. This was the first or second video course I found back in 2012 when I started learning Portuguese. I’d recommend this resource to college students who are looking for the best free resource out there. I can’t think of anything better and it complements a college class well. If you aren’t a college student, you will have to be really motivated because Brazil Pod isn’t really for beginners, it’s not as detailed as Semantica and you don’t have access to help from the creators. These video resources for Brazilian Portuguese are the best I’ve come across online. You should have no trouble learning Portuguese if you put in the time and watch them. Do you know anymore video resources you would add? Picking the wrong Portuguese books can kill.. Your Portuguese progress that is. You want to learn Brazilian Portuguese efficiently. And you want to learn it at an affordable price. Below I’ve written up a brief list of the best and cheapest Brazilian Portuguese books. I have all these books personally. My secret stash of Portuguese books. I’ve already written about the Green Book -> Learn Portuguese Fast With This Book! But I know you like options. 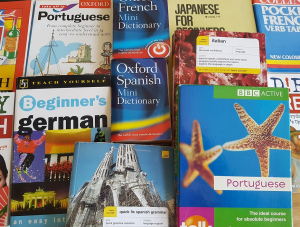 These language books will teach you how to speak Portuguese. This is the big daddy of them all. The Godfather. The Pope of Brazilian Portuguese books. The Messiah! I can never recommend this book enough because it’s just that awesome. 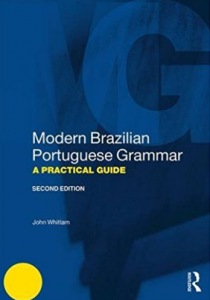 Modern Brazilian Portuguese Grammar: A Practical Guide is so good it’s like it actually talks to you. And it has the voice of Seu Jorge. The book is split into two parts: Part A and Part B. 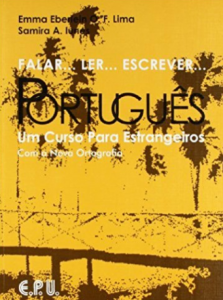 Part A: Structures explains the traditional Portuguese language learning curriculum. Part B is where the fun begins. This part is titled: Functions. The author, John Whitlam, gives you tips and tricks on how to speak in modern-day Brazil. And that’s just the tip of the ice. The book is crazy. I highly recommend it for your collection. This is another amazing book. 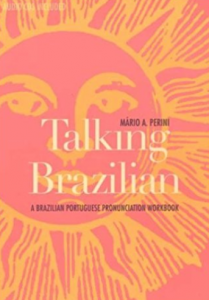 Talking Brazilian is all about the sounds and tones of Brazilian Portuguese. You will fine tune your listening comprehension as well as your pronunciation. It can be tough noticing the differences between similar words like avô/avó or caro/carro. This book will help you notice and produce these different sounds. The book has audio exercises for each lesson that focuses on a particular vowel or consonant sound. For example, Lesson 3 is about pronouncing the consonants t and d.
Then you would repeat the words. At the end of each lesson, there are phrases or conversations for advanced students to listen to. This book is great for slowing down Portuguese. WARNING: This book does not teach you fluent Portuguese. It’s primary purpose is as a supplement to a more complete learning experience like Semantica Portuguese. This is a more traditional language learning book but it’s still great for motivated self learners. I wouldn’t recommend this book unless you like to study Portuguese as if you were in a class setting. And if you already have a little Portuguese under your belt. Because Falar Ler Escrever is entirely in Portuguese. The book is split into 18 units about general topics like the city, the airport, shopping and apartment searching. Each unit has exercises, audio lessons, verb conjugations, vocabulary lists, pictures and stories. I recommend this book if you learn best with traditional language teaching strategies. This Portuguese book is crazy! Someone took the time to find the 5,000 most common Portuguese words. Beats me. I’m sure knowing how to use the 5,000 most common words is more than enough. 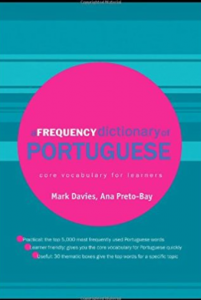 I love A Frequency Dictionary Of Portuguese but I’ve been pretty lazy and haven’t cracked it open in a while. New goal: Make sure I know the 5,000 most common Portuguese words by this fall. This book is also great because it has thematic vocabulary lists. That is – the authors grouped common words into specific themes. The book is a steal at the price. And finally, I had to add Master The Word Mesmo because it’s extremely useful. Mesmo is a powerful word in Portuguese. It can be used in many ways so it’s difficult to understand exactly what it means. I’m not sure I fully understand every way mesmo can be used but when I hear it, I get it now. And a big reason I understand mesmo better is because of this book. 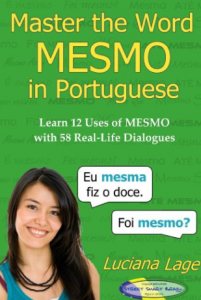 Inside, you’ll find real-life conversations using mesmo in 12 different ways with an English translation. If you want to sound more Brazilian, add mesmo to your vocabulary. That’s it. Honestly, the books you choose won’t make or break your progress if you are really motivated to learn Portuguese. If you are serious, I recommend checking out the #1 Brazilian Portuguese Online Course – Semantica Portuguese. Time is ticking. Start learning Portuguese today.